For a new initiative, our various group chairmen were asked to nominate a worthy cause to receive the initial ‘Signature Donation’, the first of what is planned to be an annual award of substantial value. After conferring with his group colleagues, Garston Group Chairman John Murphy, decided a worthy beneficiary would be St Vincent’s School, in the West Derby area of Liverpool and so prepared a thorough and detailed proposal for consideration. Luckily, we managed to stop them wearing the full Stormtrooper suit! St Vincent’s School is a non-maintained residential specialist school, providing support for blind and visually impaired children of all faiths, between the ages of five and 19, from the North West of England and as far afield as Lincolnshire. Part of the Catholic Blind Institute, the school is named after Saint Vincent, who was canonised in 1737 and was the founder of the Daughters of Charity of Saint Vincent de Paul, who ran the school for many years. The school remains in its original building and after nearly 200 years the school continues to offer specialist learning and is rated outstanding by OFSTED. On hearing that his application had been successful, a delighted John Murphy contacted the school principal John Patterson, to inform him of the award, if not the sum, to be donated and to arrange a suitable date for the presentation of the award. On a very wet and miserable Monday morning Provincial Grand Master Tony Harrison, accompanied by his wife Maureen, along with senior Provincial colleagues, as well as the executive of the WLFC, were received by John Patterson and his team, who greeted the party with very welcome cups of tea and coffee. John gave further insight into the work the school is undertaking to prepare the children for a meaningful and productive life. He informed them that nationally 85% of visually impaired pupils experience significant difficulties finding employment, have five to six less friends than sighted children and experience a lack of socialising opportunities. All of which can quickly lead to isolation and mental health issues. Amongst the many projects the school is working on to negate these issues are the provision of ‘Sightboxes’, ‘I- Rugby Balls’, as well as other ‘enrichment’ programs, such as their ceramic workshops, which our donation will help fund. John Patterson with the beautiful ceramic work of the children. 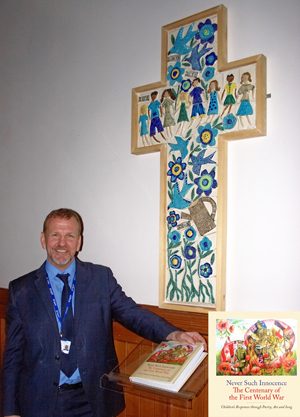 The school’s ceramic works include a beautiful ceramic cross, which is featured in the book ‘Never Such Innocence’, which features children’s responses though poetry, art and song, to the events of the First World War and is a particular favourite of the principal John Patterson. The children have produced ceramic poppies, which they sent to amongst others, Her Majesty the Queen and the Prime Minister, who actually wore hers during a broadcasted parliamentary session, in which she mentioned the school. The ‘Sightboxes’, which have already been gifted to some 14 countries worldwide, are intended for a group of pupils and are to be attached to a supported curriculum, provided by the St Vincent’s School staff and pupils. It is designed to engage creativity, innovation and enterprise. In itself, a simple box comprises of a goalball, boccia grid, boccia balls, running tethers, blindfolds, various other balls and a ball pump. What makes the box so special is its implementation and usage in providing a more inclusive life opportunity for the children, as well as the opportunity to participate in sports and the effects that has on them. ‘I Rugby Balls’, are currently in development, in conjunction with the Gubay Foundation and in collaboration with Stonyhurst College. When fully developed, it is envisaged that the ball will enable the visually impaired to enjoy playing a fully inclusive game of rugby. Once again, the benefits of this innovation go beyond the playing of the sport. John Patterson informed the Provincial party that the World Health Organisation has estimated that some 253,000,000 people worldwide live with vision impairment, of which 36,000,000 are blind and 217,000,000 have severe visual impairment and that 80% of all visual impairment can be prevented or cured. He continued by saying that sadly, after years of decline, the numbers of children born with these debilitating problems are once again on the increase. For the receiving of the ‘Signature Donation’, John had arranged a special treat for the Provincial party, who were invited to join a group of children in the school chapel. John informed the children that they had a group of special visitors and explained to them that we were Freemasons, who had come to make a contribution to their work. He then invited Tony Harrison and Kevin Poynton to say a few words to the children and to explain who they were and what they do. 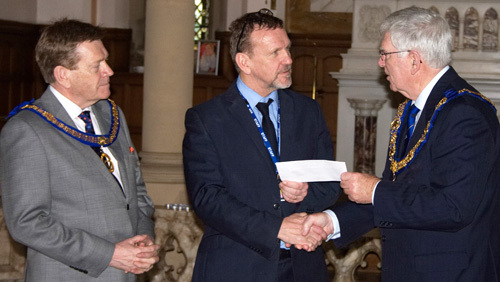 Pictured from left to right Kevin Poynton, John Patterson and presenting the ‘Signature Donation’, Tony Harrison. Presenting a cheque for the magnificent sum of £35,000 to John, Tony Harrison said: “My hope is that our contribution would help the school continue its wonderful work and I hope that we may return in the future to gain a further understanding of their work and the progress they have made.” In return, John not only welcomed a return visit but very kindly invited the Provincial party to a performance the children are holding later in the year at the Liverpool Empire Theatre. Following the presentation, the Provincial party joined the children, who were eager to ask questions, and in one particular case, one child asked to try on Kevin Poynton’s chain of office, could he be our youngest ever Assistant Provincial Grand Master? John then invited the Provincial party to join the children for a lunch of fish and chips, which they very sadly had to decline, as we were due to make another charitable donation, this time to Zoe’s Place, who have experienced significantly lower donations from the public and other charities and subsequently have had to close two of its six beds. The children and staff of St Vincent’s School with the Provincial party.